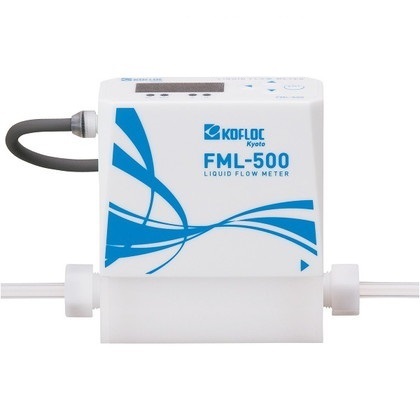 The FML-500 is a straight tube type ultrasonic flow meter for liquids. A new PFA material with excellent chemical resistance is used for parts in contact with the liquid, and the simple straight design facilitates maintenance without any obstacles inside the tube. It comes with a built-in display and the flow rate can be measured by connecting it to a power source. Flow rates up to a full scale of 5 L/min can be measured with high accuracy. ・Clean structure, with a new PFA material for the parts in contact with the liquid. ・Straight flow path ensures low pressure loss, making mainte-nance easier. ・With its built-in display, flow rates can be measured by just con-necting to a DC24V power source.